Tired of "witch wars" and constant delineation between "us" and "them"? Want to find ways to seek balance and harmony rather than division and perpetual conflict? Here is a place where sites that explore our common humanity, rather than our differences, are joyously celebrated and linked together. Find the connection between myth and science, between god and goddess, and between our perceptions of each other and the truth that lies beneath those perceptions. The element of earth embodies the principles of consistency and follow-through, which require a solid grounding based on both historical "fact" and empirical "evidence." The element of air embodies the principles of clarity and focus, which require the definition of intent and the accumulation of wisdom - or knowing when what you know is sufficient for the purpose at hand. The element of water embodies the principles of conscience and significance, which require a level of emotional depth and connection to one's inner nature, as well as an understanding of the ties that bind and the illusions that separate. The element of spirit embodies the principles of communion and relationship, which require an understanding of our place in the universe and its place in us. Resolving and accepting life's dualities (whether they are convenient illusions or concrete delineations of material being). Acknowledging causal repercussion (i.e., karmic or divine return), and acceptance of one's creative role in their own life and the consequences of that creative effort. Defining planetary ethics, as they apply to the interdependence between all living creatures as part of a single organism/ecosystem. Appreciating self-interest, self-denial, consideration of the path of others, and understanding of the divergent nature of each individual. Attuning to the basic flow of life, how it can be adjusted and maintained, and how to recognize that others, too, are singing the universal song. Developing a familiarity with a variety of spiritual disciplines, their theoretical and practical implications, and expanding one's frame of reference to include the scholarship and insight of others. Finding laughter, joy and happiness, and how they can be found in even the most unlikely places, giving cause for celebration and thankfulness. 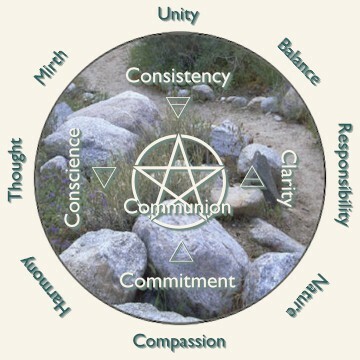 Discovering common ground, similar underlying principles, and ultimately, compatible goals within a variety of spiritual and non-spiritual worldviews.